Stretch marks are the most annoying problem a woman faces after giving birth to a child. Pregnancy is not the only reason for stretch marks. Both men and women can develop stretch marks during puberty, rapid weight loss or gain. Collagen is a protein that connects skin tissues together. Whenever skin gets stretched rapidly, collagen gets weak. The elasticity of the skin tissues get loose and gaps are formed on the upper layer of the skin. This visually appears as stretch marks. Many people depend on laser treatment or surgery to remove the stretch marks. But they have side effects and sometimes the results fail. If you looking out for remedies without side effects then this article is the solution. In this article, we have mentioned the amazing properties and methods of cocoa butter. Though it takes time to see the results, cocoa butter can help you reduce the appearance of the stubborn stretch marks. Is Cocoa Butter Good for Stretch Marks? Cocoa butter contains A, B1, B2, B3, C, E vitamins which heal and encourage new skin cell production. Its super moisturizing properties lock the moisture in the skin cells. The polyphenols present it improve skin elasticity and collagen production/retention. It promotes production of new and healthy cells. It heals the dry skin and sensitive skin. During pregnancy, apply a small amount of cocoa butter daily on your abdomen. This process prevents stretch marks by producing collagen and improving skin elasticity. If you have already obtained stretch marks then you can follow the below mentioned remedies. 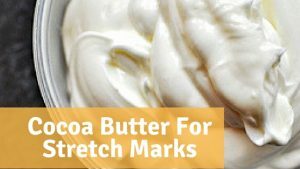 Take enough amounts of cocoa butter and gently massage it on stretch marks for few minutes. Mix 3 tablespoons each of olive oil, cocoa butter and coconut oil. Massage a small dab of the mixture on the stretch marks for few minutes. Leave it on till the skin completely absorbs the oils. Alternatively, you can use Neroli essential oil instead of coconut oil. For extra benefits, add few drops of any essential oil. Combine enough amounts of cocoa butter, aloe vera gel and vitamin E oil. Mix well and apply it on stretch marks. Leave it on until the mixture completely dries off. Apply freshly extracted aloe vera gel on stretch marks and leave it on. Around lunch time, gently massage cocoa butter for few minutes and leave it on. Before going to bed, massage a small amount of tea tree oil. Next morning, rinse off with lukewarm water. Combine 2 tablespoons of fresh lemon juice and 1/2 cup of cocoa butter. Gently massage for few minutes and leave it on to dry completely. Combine 1/2 cup of cocoa butter, 1 tablespoon wheat germ oil, 2 teaspoons grated beeswax, apricot kernel oil and 1 teaspoon vitamin E oil. Using a double boiler, heat the mixture until beeswax completely melts. Remove from the flame and pour in an airtight container. Keep aside to let the mixture cool down. Scoop out a small amount and apply it on stretch marks. Mix enough amounts of glycerin and cocoa butter. Apply the mixture and gently massage for few minutes. Now apply a thin layer of vitamin E oil to improve skin’s elasticity. If you are experiencing rashes, burning sensation or redness after applying cocoa butter then avoid using it. It is always better to perform a patch test before starting regular treatments. Don’t apply cocoa butter if you have cuts, bruises or blisters. Always use virgin and raw cocoa butter for best results. Don’t scratch the stretch marks as it can worsen the skin condition. During pregnancy, exercise or perform yoga regularly to retain the elasticity of the skin. Including vitamin A, C and E in your daily diet can make sure skin pliable and less likely to scar. Drink plenty of water to hydrate the skin. Exfoliate regularly with natural ingredients. Make sure to be gentle while doing this. Harsh exfoliation can worsen the skin. Make sure to follow the methods regularly without fail to achieve best results. Do you any other remedy that works best than the above? Have you already tried coco butter for stretch marks? Share your experience, suggestion and queries in the comments section below.